Produced in Bangladesh and the UK, new sci-fi feature film PROJECT OMMI explores themes of the developing world and living conditions where the water is polluted. 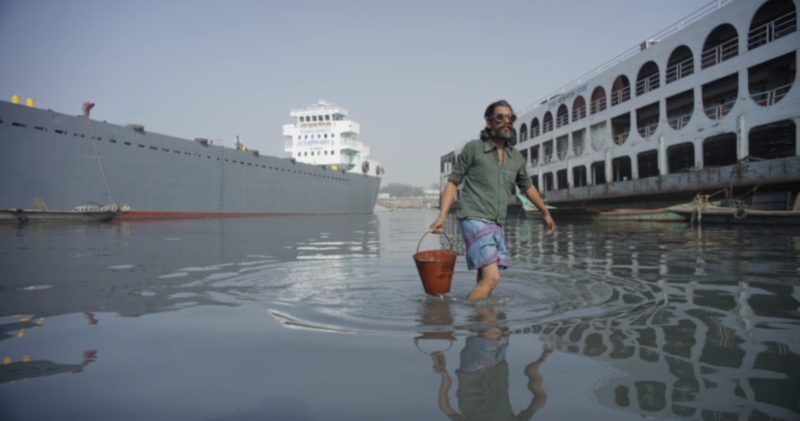 Set primarily on the ship graveyards of Dhaka (the countries capital), PROJECT OMMI showcases a futuristic world in which climate change has affected rising sea levels – an issue that is affecting water safety in the country. This stimulating sci fi thriller is host to a collection of technology, including robotics, artificial intelligence and virtual reality, which are central to the film’s plot. The film encompasses a range of technology that is used to combat the current conditions in the shipyards. In the world of PROJECT OMMI, the hydro-filter is shown as a machine that allows people to turn unclean water into safe, drinkable water. Despite being a fictional, futuristic invention, the hydro-filter represents an accessible solution to a vast problem in today’s current climate. Every human deserves the right to clean and safe water. However, a large part of the world’s population is still living with unsanitary water in the developing world. World Water Day is a fantastic initiative in which to reflect and discuss the issues pertaining to the current global climate of unsafe water consumption. Here, we explore the world of the Bangladeshi water crisis, and how local and global initiatives are aiming to change the system. One initiative very close to PROJECT OMMI is Terre Des Hommes’ FACET application. In partnership with UNICEF and the World Health Organisation, they have produced a state of the art technological application which identifies and monitors the hygiene conditions of water. The application, called FACET is currently in use in over 300 healthcare clinics in six developing countries, including Bangladesh. Terre Des Homes are making waves in life changing equipment and resources. They have produced some ground-breaking initiatives that directly connect to the themes and messages of the film. The production team of OMMI are privileged to be officially endorsed by them. The South Asian country of Bangladesh is home to the dangers of unclean water. With a large population of 163 million, the vibrant country is booming with life and culture. However, the terrifying reality is that a staggering 60% of the nation are subjected to contaminated water. It’s customary for many countries to receive their water from the origin of their country, this allows freedom to safely export and distribute that water accordingly. However, the water in Bangladesh primarily comes from rivers in different countries (with only 7% coming from their home country). One detrimental result of water contamination is arsenic, it’s estimated that 1 in 5 Bangladeshi’s have died from the outbreak. A staggering 30-35 million citizens have been effected by arsenic poisoning which causes cancer and damage to vital organs. The world is watching as the injustices truly seem abhorrent between developing and 1st world comparisons. As discussed here, there are many organisations that aim to diffuse the situation and make a change in the water crisis. The combination of awareness, institutional action and governmental support are key in making the necessary changes for safe and clean water. Shot primarily on the Ganges, we hope PROJECT OMMI will be part of the process of change, in creating a dialogue and awareness for the cinematic audience.